Create campaigns with striking and responsive designs. Send up to 200 high-quality (Gold) SMS per second. Start a conversation on Facebook Messenger and Telegram. Boost the effectiveness of your emails through social media. Marketer, Agencies, E-commerce, Developers, Entrepreneurs. Share the message with the members of your team, collect feedback and add notes on the email design and copy - seamlessly. A team of Data Scientists to boost your performances. Our best trainers at work for you and your team. Maximize performances in terms of deliverability and ROI. A creative and technical team dedicated to your campaigns. Send unlimited emails to unlimited recipients. Zero fees or fixed costs, pay only for what you send. News and strategies to become a Digital Marketing pro. Get familiar with MailUp’s main features. Quickly understand the functions of the MailUp platform. In need of assistance? We’ll get promptly back to you. How we became an international presence in 50 countries. How we help companies to reach their target. With 8 locations, we are close to your business. View current openings to join our team. MailUp is green: our commitment to the environment. News and information on the financial world of MailUp. Discover how we help companies to reach their target, thanks to case studies split between goals, strategies and results. 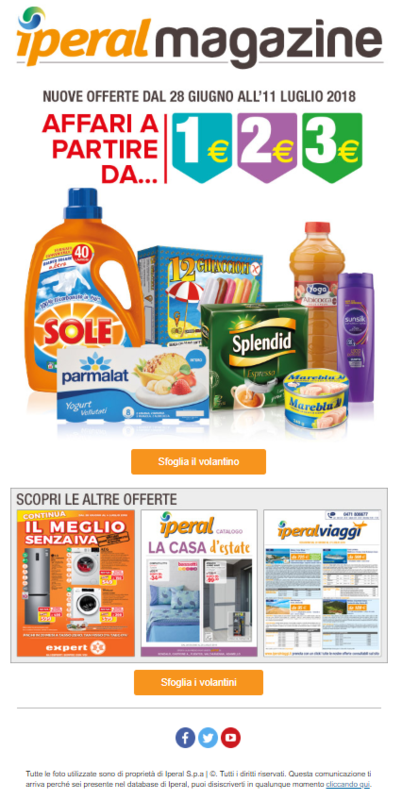 Iperal is a large-scale distribution company present in seven provinces of Lombardy (Sondrio, Lecco, Como, Monza Brianza, Varese, Brescia and Bergamo) with over 40 stores. In 2012 Iperal undertook a digitalization process that led it to become a growing company in the large-scale retail market and a reference point in Lombardy. Progressively evolving to offer increasingly targeted communications in line with the customers needs. Thanks to MailUp's workflows, one-to-one relationship is possible. In 2012 Iperal undertook a digitalization process that led it to become a growing company in the large-scale retail market and a reference point in Lombardy. Eliminate the distances between the online dimension and its stores. Given its needs, Iperal identified email as the best channel for getting in touch with its customers. Following the creation of an internal digital team, Iperal relied on the MailUp platform to manage its email marketing strategies. Its newsletter sent every 10 to 15 days is of particular interest: Iperal has a large assortment of products to promote, and had to segment the sendings into different clusters. Iperal's newsletter takes full advantage of the email channel's potential, interweaving information and promotional objectives, thereby integrating content marketing and email advertising. All within a large layout which at the same time facilitates the rapid scanning of content. For the future, Iperal has planned the definition of strategies (based on email automation) of cross selling, top selling and the recovery of abandoned shopping carts, all with the support of Digitelematica. Moreover, thanks to the integration between the website, MailUp and CRM, Iperal will develop automation actions triggered by each recipient's type of interaction with coupons and promotions. In 2017, there was a 24% increase in users who subscribed to Iperal's newsletter. This sharp increase can also be seen in its campaigns' performance, which show a higher opening and click-through rate - 20% and 6% respectively - compared to the average results of the large-scale distribution segment (obtained from the MailUp Statistical Observatory 2018). The data related to segmentation is interesting: by defining eight different sending clusters, the newsletter recorded a near 30% increase in clicks on the various contents. Understand your emails as flyers which present offers and send recipients - with just one click - to explore items and products on the site. Create a responsive modular structure with the BEE editor: its grid layout easily hosts a large amount of content while preserving legibility. Segment your recipients into clusters to improve engagement and performance across the entire funnel: openings, clicks, conversions. Disseminate your purchase incentive communications: gifts and coupons that shorten the distances between the online and stores.